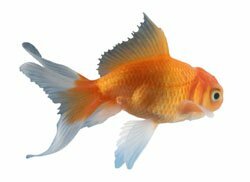 IT IS time for the scales to fall from our eyes: scientists have claimed not only that goldfish have a memory span of up to three months, but that they can also tell the time. Scientists at Plymouth University have successfully trained the fish to collect food at particular times of day, showing the popular notion of the three-second memory to be very fishy indeed. The findings add to a growing body of evidence that fish are much more sentient and intelligent than had generally been assumed. Recent research has suggested that fish feel pain when they are caught on a hook, can be manipulative and socially aware, have long memories and are able to recognise their shoal-mates. The research, led by Phil Gee of Plymouth University, has added a sophisticated body clock to the piscine intellect. In his experiment, goldfish were placed in a bowl in which they were fed only when they pressed a lever. The fish rapidly learnt that pressing the lever produced a food reward. Once they had been trained in this way, the researchers set up the lever to work for just one hour a day. The fish soon became wise to this, and learnt to press the lever at the same time every day to feed. “The fish worked out that if they hit the lever around that time, they would get some food,” Dr Gee said. “Their activity around the lever increased enormously just before the set hour when their food was dispensed. The study could have implications for fish farming, Dr Gee said. He suggests that it should be possible to train trout and salmon to swim to feeding stations on certain signals, making it easier for farmers to monitor and harvest their stock. Are the smartest men the sexiest? Are some mice more intelligent than others?